(a traditional & natural way to preserve fruit). is the Greek word for “spoon sweets” (fresh fruit boiled in water with sugar). “Spoon sweets” have traditionally been a treat for guests; as well as a natural method to preserve fruit. Selected Greek sour cherries, pitted and cooked with “grandma’s secret recipe”. on Greek yogurt for a healthy and refreshing desert. Try them on as topping on ice-cream, cheesecakes, cakes, tarts, pancakes and crepes. Or you can try the “old fashioned way”: serve with a silver spoon and a glass of ice-cold water, as a hospitality treat for your guests. 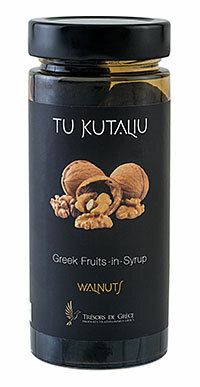 Greek small walnuts 55%, sugar, glucose syrup, acidity regulator; citric acid, preservative: potassium sorbate. flavourings. May contain sulphur dioxide traces.